The history of Okinawa soba is murky at best. A common story is that the dish originated when Chinese dignitaries presented it at the 49-day memorial service for the king of Ryukyu Islands, Sho Shin, in 1543. The fact that Sho Shin died in 1526 discredits this account, though there is evidence that flour was introduced to Okinawa by chefs from present-day Fujian Province, China, while accompanying a Chinese ambassador in 1534. Another, generally more accepted story attributes the creation of Okinawa soba to yet another Chinese chef, this one upon opening a restaurant in Naha during the Meiji Era (1868-1912). Whatever the true origins of Okinawa soba may be, what is certain is that after Okinawa reverted to Japanese administration from U.S. control in 1972, the dish’s use of the soba moniker prompted a trademark imbroglio that eventually resolved on Oct. 17, 1978, when the Japanese Fair Trade Commission officially recognized Okinawa soba as distinct from soba on mainland Japan. 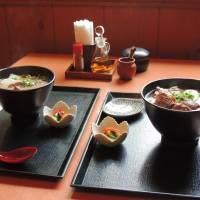 Ever since then, Oct. 17 has been known as “Okinawa Soba Day,” and hundreds of restaurants around the prefecture celebrate with deep discounts or special promotions. Okinawa soba is distinct because it uses 100 percent wheat flour, whereas mainland soba is made with buckwheat. Okinawa soba is therefore closer in flavor, texture and consistency to udon, another wheat-flour noodle. What udon lacks, however, is Okinawa’s celebrated and mineral-rich sea salt, which is sweet and calcic thanks to the coral reefs that ring the Ryukyu archipelago. Okinawa produces more sea salt per square kilometer than any other prefecture in Japan, and the scores of local varieties and methods of production are just one factor separating good Okinawa soba from the truly great. Salt also plays a role in the dish’s dashi. The soup stock commonly uses pork and dried bonito as a base, though chicken and konbu (kelp) are common as well. 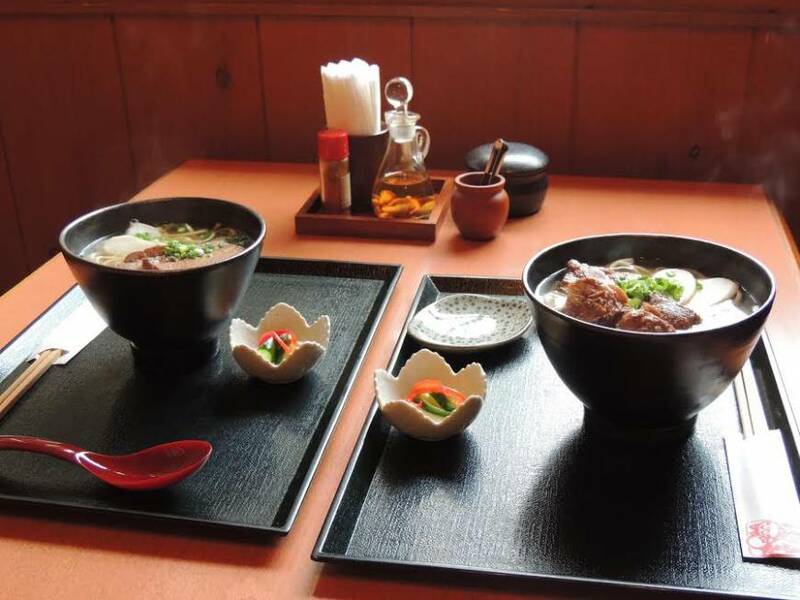 While there are regional styles and individual variations in noodle and dashi recipes, the typical bowl of Okinawa soba is finished with pickled ginger, shima-negi (Okinawa-grown green onions), kamaboko (fish cake), and sanmainiku (boneless pork ribs) or sōki (slow-stewed pork spare ribs). Okinawa soba even gets its own condiment, kōrēgusu, which is a pungent concoction of chili-infused awamori, Okinawa’s native spirit. Okinawa soba restaurants can be found virtually anywhere in the prefecture, but one of the very best is a few minutes’ walk from the main drag of Kokusai Dori and Kencho-mae Station in central Naha. Ryukyusabo Suru first opened in 2004 when owner Hisako Okuma found an old, termite-ridden building and envisioned an Okinawa soba restaurant in its place. As an amateur chef who’d only ever made Okinawa soba at home, she commenced her research by eating her way around Okinawa’s main island. 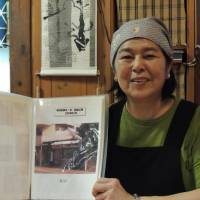 Okuma found she favored the elastic noodles and simple, light broth of the now shuttered Tansui in Itoman, on the southern end of the island, and approached owner Koichi Morishita. 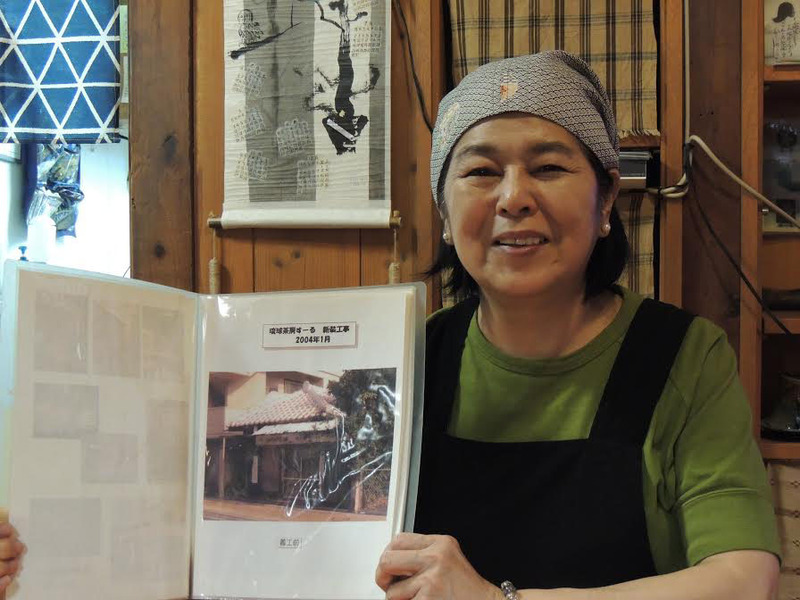 The elder chef became something of a mentor to the aspiring one and, before long, the two Okinawans had struck a deal: Okuma would sell the noodles that Morishita had spent 30 years perfecting. The production of these noodles had already been outsourced to a small Okinawa soba producer called Nishizaki Seimensho, one of 20 such companies that make up the Okinawa Namamen Cooperative, the long-standing labor union that helped win the official Okinawa soba designation in 1978. Rather than teach her his exact recipe, Morishita was helping Okuma find one of her own. Departing radically from a traditional pork-based soup stock, Suru’s current recipe uses a duo of local sea salts, iriko (dried sardines), dried bonito, konbu, chicken and Kumesen awamori from Kume Island. “I am selective about ingredients,” Okuma says. Every bowl of Okinawa soba at Suru is an exercise in symmetry. The dashi is full-flavored but not overly rich, the noodles thin and springy, and the sōki so tender a slight prod sends it tumbling off the bone. Omura makes her own kōrēgusu, too, and several 4 liter jars in the process of infusion are stacked on a low shelf in a back corner of the shop. A tablespoon added to the broth lends a biting, slightly boozy astringency that works in careful contrast to the dish’s more oleaginous flavors, but too much can throw off the original balance. After all, a dish five centuries in the making is bound to be a delicate thing.